Hold on to your hats, you're going to love this CD. 18 sing-a-long jingles, you and your kids can enjoy, while at the same time learn manners for all occasions. Statistics show that children learn faster and remember longer when they learn information through singing, rhyming and chanting. 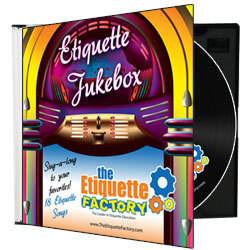 You and your children are going to be amazed at the fun, yet the wisdom that will be gained through singing these sweet, funny and amazingly entertaining songs about etiquette. For ages preschool through 4th grade.